Hope at the Line and Alibi on Deck! I’ve taken an emergency replacement judging assignment for the weekend. I thought I was going to get caught up with TDAA course reviews. Oh well, I still have the week ahead of me for that. I’m in Raleigh, NC. It has been a lot of fun working with the people in this area. They’re lovely folks and charming in their southern hospitality. I’m pretty sure that as my boy Kory gets old enough for competition I’ll be looking for trial opportunities in this part of the world. This snippet is from Pat Corl’s Grand Prix course… which I judged. 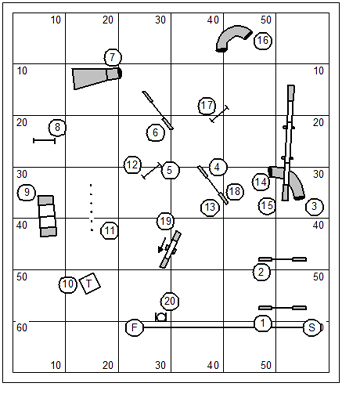 This was a lovely Grand Prix course on paper… but ran much rougher. Often we see a course that’s an absolute tiger on paper runs sweet and smooth. This course was the contrary… it looked sweet and smooth on paper, but ran like a tiger. An extraordinary high number of NQ scores were earned on the two jumps following the stereo performances of the 20’ pipe tunnel at #5/10. I’d like to offer a hypothesis for this. I say from time to time that the pipe tunnel is a cannon; and it fires the dog like a cannon ball into space. Mostly the “firing” is random and inaccurate because the dog cannot be influenced by the movement of the handler… who he can’t actually see. In the first pass through the pipe tunnel the handler is trapped behind by getting the dog out through the tire while dodging the #14 jump option. And so the handler loses the long foot race back through the long pipe tunnel which allows the dog to curl sharply out of the tunnel, earning a refusal at the #6 jump. On the second pass through the pipe tunnel the handler more often than not gets into the pipe tunnel with dog-on-left and so risks losing the dog to a wrong course as the dog curls back to jump #6. What are the colors of the snooker flags in the USDAA (#1 through #7). I’m working hard at the June Joker’s Notebook. I don’t really know if I’m going to have it done in time. But I’m having a lot of fun with the material. This past week I set up the floor for box-work, using the basic Hobday box and spawning a variety of sequences through the performances of the box. This is a building-block kind of arrangement of hurdles. It doesn’t really have to be strictly square as shown here. Often the boxes presented to us in competition are a bit misshapen and not very Victorian in their geometry. It’s worth noting that the box is closely related to pinwheels of all shapes and sizes. In this drawing, jumps #1 through #4 show a three-jump pinwheel; while jumps #4 through #8 are arranged in a classic four-jump pinwheel. When expanding the discussion to pinwheels with my own students I’ll invariably point out the true angular geometry of the pinwheel rather than the fatal illusion of the circle. 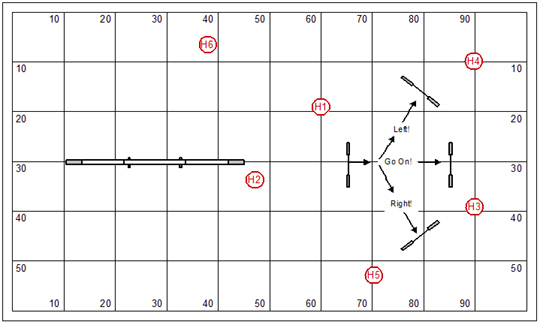 Invariably when practicing with the Hobday box you’ll also want to practice the dreaded 270° turn as illustrated here. I’ve superimposed over the white numbered sequence another variation (in dark red numbers) that looks suspiciously like a 270° turn but is, in fact, merely a 180. 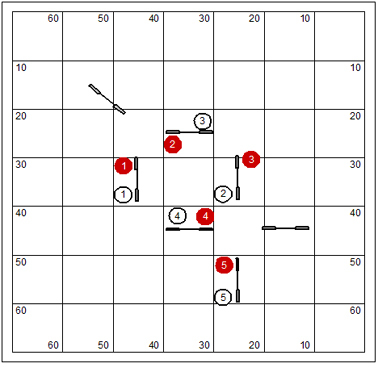 I like to use boxes and pinwheels in dog’s choice games, especially games like “What’s My Line” in which the handler has to figure out a strategy for doing all of the obstacles one time only but are required to do each. It’s always a test to see if the handler sees the alignment of jumps and aren’t stuck in more stodgy flows through the box. Note by the way how serpentine-like is the arrangement of jumps along the edge as drawn here. Smelters don’t have to smoke! What is the process by which copper is extracted from a solvent leach and then attached to a cathode by electrical attraction? As I labor in the lower field schlepping equipment around, cutting grass and so forth… I cheer myself up with the notion that not everybody has a big field and plenty of equipment to make an agility playground. From the rigid definition of the basic training exercise I can be a bit playful in setting equipment to create flow and approach challenges that have serendipitous merit. It’s kind of a game of “what do you make of this?” Well mostly, that’s fancy language to say that I’m putting all of the equipment already on the field into use so I don’t have to haul it back up the hill to put it away in the storage tent. Over the next month I’m bringing up Kory’s jump height and I really want to do so on nice thick turf rather than on the rubber matting of the training building. And I think I’ve said that I really like working outside. If a dog gets good footing he’ll learn to run and jump confidently. Two-A-Days are very important because practice in agility is rather like practice with dancing. The partners in the dance need to learn to understand the subtle pressures and nuances of each other. This can only be accomplished with repetition. I am very careful not to be obsessive-compulsive in my approach to practice with my boy. We might do this sequence three or four times only in a give workout. Add to the 40 to 50 jumping performances some chasing of a Frisbee and a good deal of tugging. That’s an adequate workout for a dog who’d otherwise work until he drops. You’ll recall I’ve posed for myself and Kory a simple training objective, to master directional language in the face of multiple options (in this case, on the dismount of the dogwalk). What I find with Kory is that he tends to take “Left” and “Right” as hard-aback instructions. For example, if had dog-on-right on the dogwalk going east to west on this set and from his 2o2o I tell him “Right” … he’ll have no difficulty flipping back into the opposite side of the pipe tunnel. So, if we’re heading the other direction, dog-on-left his “Left” instruction on the dismount of the dogwalk might have him looking back more to the long jump than the slighter and more modest bend out to the #4 jump. A development in our language is the idea that each option that comes to view represents the target. Mostly I have to be quick to get out the performance verb as his nose comes around to it. So the instruction from the 2o2o sounds very much like “LeftJump” because the event of the jump comes so quickly into focus. 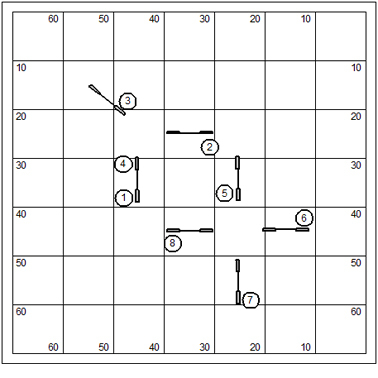 The directional language is intended to be “precue”. This is important to understand. If I want Kory to turn left after a jump, for example, I will tell him “JumpLeft” with the complete expectation that he’ll hit the jump curling into the turn. If we take this to another conclusion, I’ve also begun giving him turning instructions on the approach to a pipe tunnel. 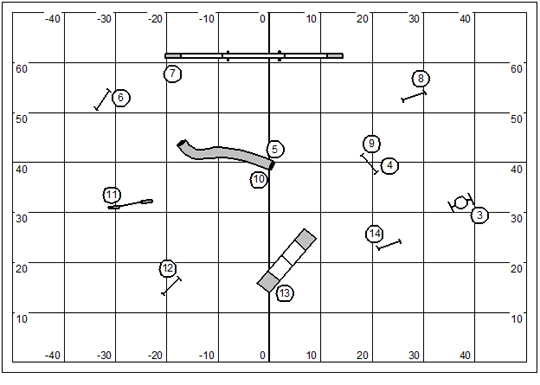 In this exercise, in the turn from the #7 pipe tunnel to the dogwalk at #8, we’re making the approach to the tunnel we me on the side away from the curl… and so after the long jump I will tell him “TunnelLeftLeft” before he actually gets into the tunnel. Repeating the Left instruction is just about required to get him to tighten his turn out of the tunnel… to make a neat transition up onto the dogwalk with me nowhere near to “handle” the transition. The local club really hates me. I committed that unforgivable sin… moving into their pop ‘n jerk backwater part of the world. This move was supposed to be semi-retirement for me; and boy I sure got what I asked for. The real downside of it is that my little girl Hazard has been suffering from non-confidence issues. It would have been very healthy for her to get out on other equipment other than her own back yard and her own training building. But you know POTC won’t even let us enter our dogs in their local classes. And so any rehabilitation option for Hazard has been impossible. As Kory comes of competition age I’ll be taking both him and Hazard out on the road with me. What I’ve been doing is looking for alliances with other clubs within reasonable driving distance where I’ve promised to come in and do nearly give-away working clinics just to have the opportunity to get my dogs on other equipment. What I’d really like to do is trade working clinics for travel expense and entry fees. Most venues have some prohibition against doing training on the trial equipment (esp at the trial site) on the day before a trial/competition. So the structure of such a trade would probably entail a Monday morning working clinic. Since it’s nearly a give-away the club could use the clinic as a reward for trial-workers; making it a win-win for me and my dogs and the club and their hard working supporters. 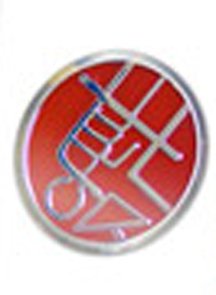 What is name of the (fictional) government agency that uses the logo pictured below. I apologize for the poor quality of the image. It is rare and hard to find. With considerable regret and grief I have put my sweet old boys Bogie and Birdie to rest. They died in my arms at the vets. I will almost surely go to my grave with a deep sense of guilt at my betrayal. On the morning they both gave me sweet kisses and wags of their tails. When I was 15 my dog Smoky lay in blind agony all night long awaiting the vet’s office to open in the morning before we could take him. And I’ve been of a mind ever since that I would not allow a dog of mine to suffer again. Bogie and Birdie both have been in terrible decline this year being blind and deaf and losing appetite and having painful inconsolable events. What a selfish thing for me to put them out of my misery. Okay, there will be grief and regret on either choice. You know the choices right? You either wait until the dog’s suffering is unbearable; or you make the hard decision early, knowing you’ll be haunted by the notion that you were premature and they might have sprung back to vigorous life at any second and gone running down the hill demanding to chase tennis balls and play agility. I had thought to write them an homage here of all their wonderful rompings and accomplishments in the world. But I found it to be a vain and egotistic exercise. Maybe I’ll do that later when I don’t feel such grief. Only dog people read this web log of mine, clearly. And you’ll be tempted to write me something to console me. But I know a thing about all of you and me. We fill out lives with the care and love for these fragile temporary creatures. And every one of you will feel this grief and loss. Most of you have felt it before. There is no consolation. God bless you all. I miss my sweet boys. And I love them. I planned a spot with some care and prepared my boys a look-out from the top of a hill. I arranged flowers and a small oak tree for planting with a barrel of amended soil. They lay now facing north with Bogie in the lead and Birdie just behind, chasing Bogie’s tail, his very favorite sport. I left a tennis ball for Bogie and put an ADCh ribbon between the two of them. When you dig a grave you move the earth twice. The first time it is a chore of grim determination giving you the opportunity to argue with yourself with each spade full. The second time you’ll feel the finality of it knowing you cannot ever take it back. I had a student last week who told me “I’ve never done agility outside before!” Oh my. Later I remember thinking about what a culture shock it was for me to adapt to training and trialing indoors. That shock pretty much coincided with my move east from Arizona. Has it really been 15 years? Natural turf is probably the ideal surface for a working dog. I have put off raising Kory’s jump height (to the highest settings on the jump, mind you) until we could be out of doors. Oh, and while Kory is now about old enough now to compete in the AKC I have yet to jump him more than 20″; and frankly usually practice with him at 16″. And I’m not ashamed to practice with him at 12″. Full height jumping is such a small part of training, after all. In order to further the training ambitions for my dog I’m keeping the lower field mowed and will put up a new foundation exercise each week. It’s hard to stay ambitious about maintaining the lower field when the prospect of working under the “weather” inspires complaint from your students. Selfish motivation is likely the best catalyst for action. 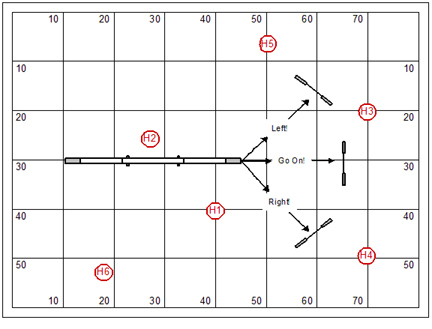 Course design in agility often features options for the dog’s path. What I should like to do is cultivate a working language for my dog that resolves the option and provides good information. A dog works from a “reference library” to understand directions for performance given by his handler. When my person wants me to do A-thing it looks like/sounds like A-word! In our practice we establish language for performance. And mind you, practice is not simply for the benefit of the dog to learn a word/phrase for performance; the practice is also for the handler to learn and understand the use of the word/phrase for performance. I’m a little torn about using absolute directionals in this exercise. I’ve for so many years competed with dogs for whom I might always be in position for the relative directional that it becomes ingrained into my philosophy of handling strategy. However now I must accept that I need to train this dog to be directed while my position might be nearly anywhere relative to his. 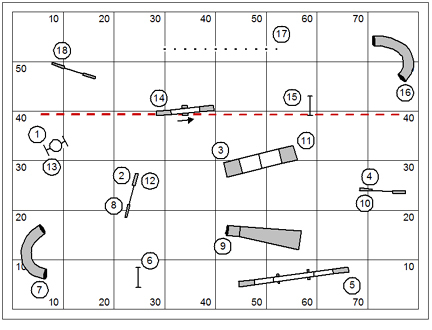 All of the little red H# markers on the course map represent prepositional handling stations. If my station is readily within my dog’s field of vision I will try to complement the verbal phrase with the movement expression. Movement should always be in harmony with verbal. Having introduced and practiced the three directionals to solve the options from a dead-stop at the end of the dogwalk; we advance the directional practice to a dog in full motion. The handler’s directives must be timely as well as correct. To tell you the truth I can’t say that practicing the directionals for the option is simpler with a dog in a 2o2o at the bottom of the dogwalk, or in full flight as is proposed here. In some ways a dog in a full stop might be harder to direct and may even give some lessons in Newtonian physics. Before I leave this exercise behind I must make a note about generalizing performance. I should apply and test the skill I’ve been practicing in a variety of contexts. Fluency with any language relies on practice and consistency of use. It might be a good idea to find opportunities to practice that language. Indeed sometimes it is a matter of recognizing not just the opportunity but the necessity for the word or phrase the handler should speak. What is the sharp tool that rational philosophers apply to theories that promote unnecessary hypothesis? The game for the week is quite a simple game. The handler will direct the dog on a simple numbered course. 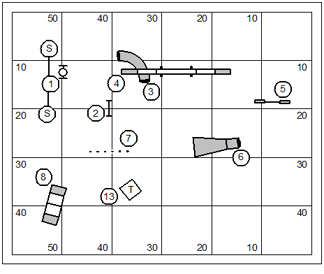 If the dog can perform the last three obstacles on course (#16 through #18) without fault and while the handler works on the opposite side of the handler containment line, then the dog will earn 25 bonus points. 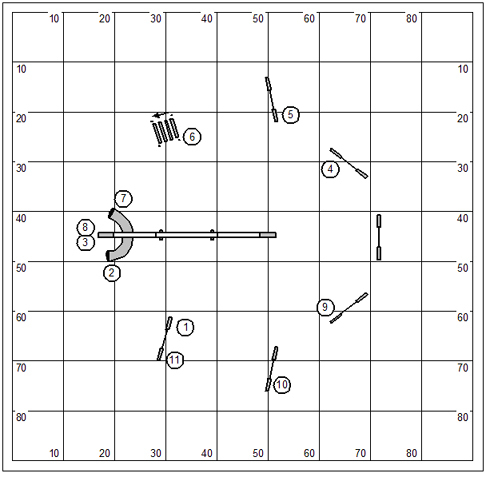 The game is scored Time, Plus Faults, Less Bonus. The dog with the lowest score wins. Write a sentence that ends in four prepositions. If it requires a story in preamble, that would be acceptable. First acceptable answer, posted as a reply to this blog post, wins a free copy of the June Jokers Notebook. I’ve been busy and that’s probably a bit of an understatement. The true fruits in a blossoming of spring are the many chores and labors of upkeep on our rural property. It’s been a wet enough spring that it seems like we’re mowing the same grassy patches every four or five days. At the beginning of the week we drove to the eastern shore Virginia to pick Marsha’s new BC pup “Tempest”! T is Kory’s half brother, having the same sire. He’s a rambunctious tri-colored little thing, very driven at only nine weeks of age. 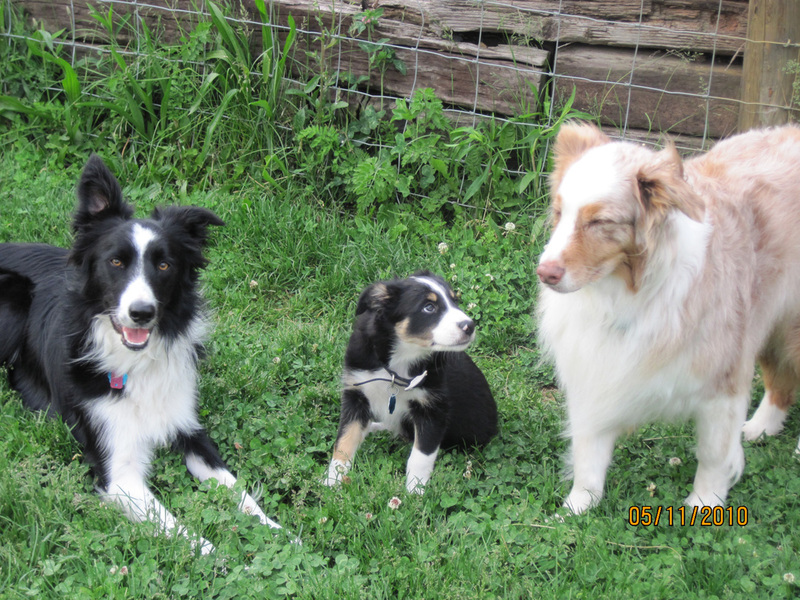 From left to right in this picture: Kory, Tempest, and Dash (our 10 year old puppy). I’m pretty sure the entire litter hasn’t been spoken for yet. If you’re interested in a high drive pup with impressive working credentials in the pedigree, you might check out the breeder’s web page: http://www.jijinkennels.com. Oh, but disregard any mention of the pup “Rex”… because that’s our boy Tempest. I had an epiphany on the drive out through Virginia this past week about the content of the Joker’s Notebook. While I’ve written designed curriculum forever for the agility instructor doing group classes I think where I need to go, for awhile, is the design of the daily exercises that refine the skills of the dog and handler agility team. The main theme is still “distance”, mind you, but what I really need to do is share the exercises that I set up in my own field for my boy Kory. Foundation skills need to be continually reinforced, polished and refined. These essential skills should not be considered as a job that is done once, like building a brick wall that, when it’s done, the builder walks away content that the wall will stand. In dog training you might think of the foundation skills more like painting the brick wall. When freshly finished the paint is gleaming and bright; but will over time fade and chip. Over time the dog’s trainer might want to make refinements or raise criteria for a specific performance. 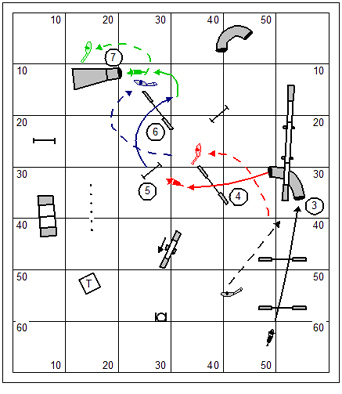 For example, in the unambiguous finish of a contact obstacle the handler might desire the ability (power) to run in any direction while the dog assumes and holds the bottom position until released. So… to continue the analogy, we’re going to repaint the wall; and brick-by-brick we repaint the entire wall. The daily training of the dog should address what we consider the foundation for the skills for the dog while continuing to raise the criterion for performance. And that will mean that the trainer continues to address the entire methodology of the skill from introduction to proofing for each of those vital skills. This requires a checklist of foundations skills for the dog and a fairly well-defined definition of the training steps for each. That checklist might be unique to an individual dog; but is more likely to be unique to the dog trainer’s approach to the necessary skills for performance and the methodology use to achieve those skills. Having made the list the dog trainers set of daily exercises for the dog should give room and training space to address each of those skills. Too often the dog trainer/handler will want to play and practice in the realm of skills in which they are most comfortable and successful. This leads to ignoring other important skills which may over time degrade. Mindful of our training ambition the daily training exercise with a dog should both fortify the foundation skills and incrementally increase the criteria for performance. Early in the history of modern dog training someone wrote that working more than about 15 minutes might become irksome to the dog and so counterproductive to the training mission. And yet the positive dog trainer who relies on play and reward to train the dog might get considerably more than 15 minutes a day out of the dog. The dog trainer needs to take care not to overwork the dog…. even the dog having fun playing a game. A dog overworked can be injured or suffer from dehydration and heat stroke. Here’s one I set up in the lower field. It’s too big for our training building. For Kory I envisioned three, three times a day. Well, we didn’t even get done with the first day… and Kory was killing the huge pinwheel, and the tricky serpentine start & finish, with me pretty much loitering near the pipe tunnel, giving verbal directive. You’ll probably recognize that this is an expansion of the “exploding pinwheel” exercise; a protocol I’ve followed with all of my distance working dogs. This exercise has escalations… as many good exercises do. I’ll probably go through those in great detail in the pages of the June Joker’s Notebook. Frankly, I’d like to film some of our exploits on the working exercises and put links out on U-Tube so the development of the exercise is more than two-dimensional. Our revels now are ended. These our actors, As I foretold you, were all spirits, and Are melted into air, into thin air. Okay this one’s easy; but still: the first correct answer, posted as a reply to this blog post, wins a free copy of the June Jokers Notebook. This week I have a couple from St. Louis here for a series of private lessons (and the relaxing vacation part as well). They’ve brought along a pack of Yorkies and so the lessons have resolved to TDAA-style course work. The real difficulty in the TDAA is in understanding how to move well; and how to find the real estate to move at all. A course like this is bad enough in the big dog venues where many of us want to emulate the lazy handling habits of the big fast dog handlers. On a teacup course lazy inside-the-box handling will be positively deadening. On this course the handler makes the attack on the course with really basic fast dog handling tactics… behind and pushing. 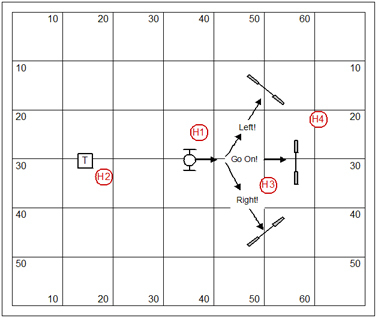 The handler might even take a long lead out to ensure that he starts the course in as lackluster a fashion as possible (black lines). 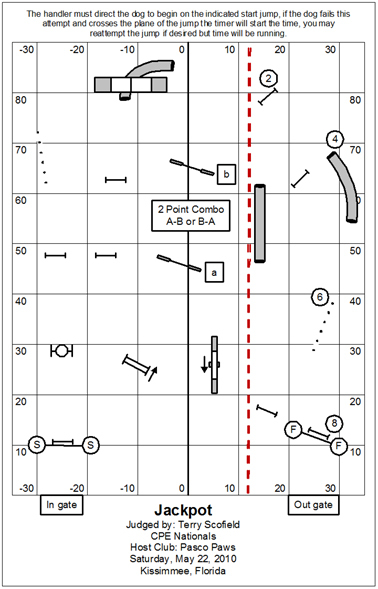 Then the handler draws the dog through jump #4 and crosses behind (red lines). 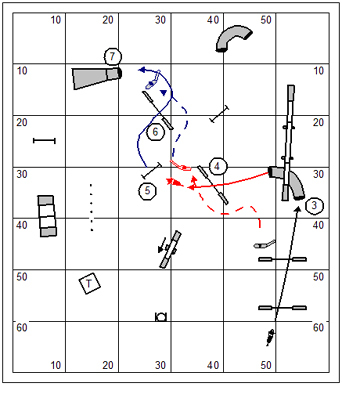 And finally the handler sets up to cross behind the dog on the turn from jump #6 to the collapsed tunnel at #7 (blue lines). Okay then, if the dog requires a speed cue from the handler (and at least half of them in our sport do)… then the handler couldn’t have failed more utterly at giving that speed cue. Truly, when the strategy is behind-and-pushing (fast dog handling)… then the handler has to slow down to allow the dog to move forward. And as the handler sets a pace that indicates nobody is in a big hurry… then the dog will be happy to take that cue. What would it look like if you’re in a hurry? So here we have a handler doing all his movement forward-and-pulling (slow dog handling). And frankly we’re going to ignore the hysterical admonitions of all the numb-nuts in agility and do the whole opening sequence with a series of Blind Crosses. Note that this handling plan has one more element than the previous. The handler will have to run farther and run faster. The handler will actually have to run. The Blind Cross is a racing movement… and the handler had better be prepared to win the race for it to work. And it will give such a speed cue that many dogs will improve to a remarkable extent in just the first seven obstacles of this course. I’ve put a finish to putting in my garden for the year. I’ve added a couple dozen sweet corn plants, and some cucumber and watermelon. Last week I got in a healthy bed of Vidalia onions; red potatoes; three varieties of tomatoes; and three varieties of green peppers; broccoli; and cauliflower. I’ll try to stay after the weeds and grasses this year. I’m looking forward to fresh vegetables right out of my own garden. On Monday Marsha and I are going to pick up her new pup, a Border Collie who is half-sister to my boy Kory (they share the same sire). And as it happens, we’re going to pick up a pup from the same litter for Marsha’s sister Janice, who is retiring from her teaching job in a couple months. That will be an absolute hoot. Janice probably doesn’t know it yet… but she’s heading for a fun retirement hobby in dog agility. I’ve been too busy to attend my blog properly. Oh, and I’m way behind on all the free Notebook copies for daily winners of my so-called “Google-proof” trivia contest. I’ll catch up within a few days I’m hoping. What will Marsha name her new pup? The breeder names her dogs after weather systems or phenomena. WWWSD? The first correct answer, posted as a reply to this blog post, wins a free copy of the April Jokers Notebook. 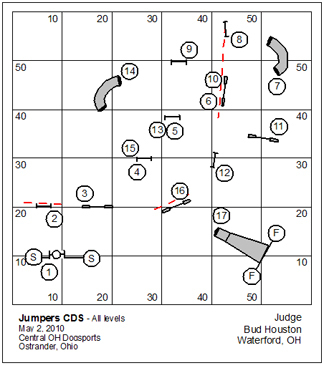 In Jumpers CDS a dog runs a numbered course during which the handler must call, direct, and send his dog to perform three distance challenges. 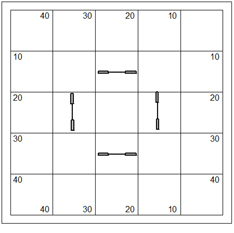 Containment lines are drawn to indicate an area into which the handler may not advance while the dog performs obstacles at a distance. If the handler steps on or over any containment line while the dog is performing the indicated obstacles, or if the dog commits a performance fault in the performance of the obstacles in that challenge, the chance of a bonus will be negated. Call – The Call is a lead-off at the start line. To earn the bonus the handler must call the dog over the opening obstacles (#1 and #2). During this portion of the course, the dog is placed on a wait at the beginning of the course while the handler leads out past jump #2. If the dog starts before the handler gets to his containment, or if the handler is required to reset the dog, the bonus will be lost. The Call bonus is worth 5 points. 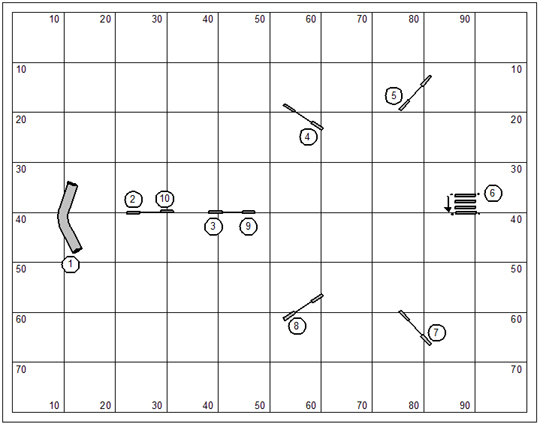 Direct – The Direct is a mid-course gamble sequence (#6 through #8) that the dog must perform at a distance. The handler must direct the dog over the sequence of obstacles without crossing a containment line. The Direct bonus is worth 5 points. 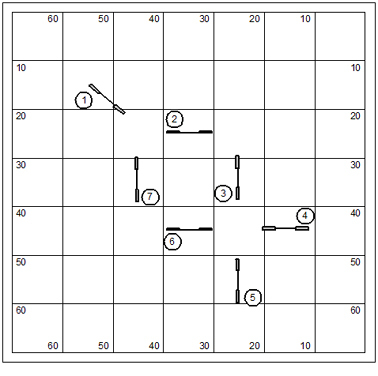 Send – The final two obstacles on this course (#19 and #20) is the Send. In this challenge, the handler must not cross the containment line until he dog is through the collapsed tunnel. The Send bonus is worth 5 points. A special bonus of 10 points can be earned in the send if the handler stays behind the double containment line at jump #15 for the final three obstacles on this course. 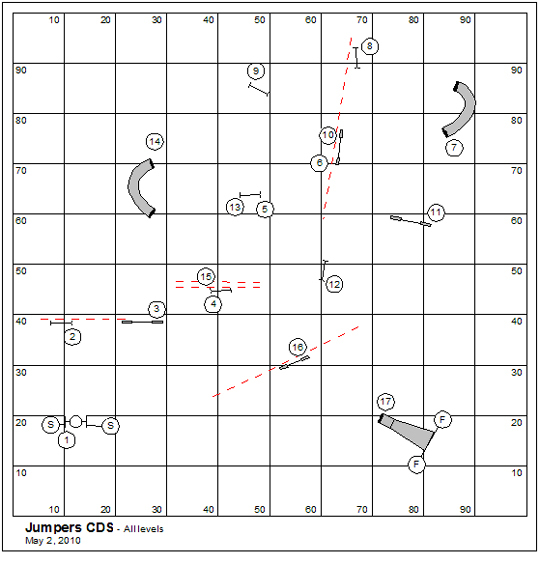 Jumpers CDS is scored Time, Plus Faults, Less Bonuses earned. The team must earn a score equal to or less than the QCT/SCT for the respective jump height and division in order to qualify. With my young 22″ Border Collie pup, Kory, I find myself looking at any course with the litmus of performance and actually seeing my dog in motion. So I look at the TDAA course I design and can’t help but shudder and flinch at the short transitions and tightly turning sequences. Then, I must stand out on the course and judge several dozens of dogs on this sequence of my own design. I’m reminded that the TDAA concept was for them and not for the fast long-striding agility dog. Indeed for the quick little agility dog the performance is certainly on the edge; and the handler must be keen and timely. But that was exactly the point of the TDAA… to give the small dog handler the same thrill of playing “on the edge” that the big dog handler has in nearly every other venue. Maybe I’m just too subtle sometimes… The opening sequence shown here is from a TDAA Superior course that I designed, judged last Saturday morning. As it turns out the most likely place for a fault in the course is in the straight-forward transition between the collapsed tunnel and the weave poles. And the fault was a wrong course to the table. The problem, as I saw it, was that too many handlers insisted that they have dog on right through the collapsed tunnel. This will dispose the dog to come out of the chute looking to the side the handler was on going in. And any directing the handler does while the dog is in the chute is pretty wasted, don’t you know, because the dog doesn’t actually see it. Just what is so unusual? Nothing that I can find! A curious and unusual paragraph stumps my mind! What’s wrong with it? I just can’t spot a thing! Again and again I look at it but nothing occurs to my poor brain. I thought it through without any assist; but who would work as my coach anyhow (Bing.com, possibly)? Now I’m thinking that this complaint that I craft is just as unusual and just as curious. You are currently browsing the Bud Houston's Blog blog archives for May, 2010.